It has been a little bit more than a week since I returned home from the annual ISTE conference in San Diego. This will be the first of many reflective posts I write as I have many takeaways rattling around in my head. One of the highlights of the conference for me was listening to Sir Ken Robinson speak as part of the keynote and then as part of a Q and A follow up. Now, I won’t get into the horrible job other panelists did, but Sir Ken mentioned something that stuck with me during his Q and A. At some point during the Q and A Sir Ken made a statement basically stating that teachers often have more freedom than they willingly exercise. Essentially, we complain about all the restrictions and “boxes” we are placed in but we don’t push the limits and see what we can actually do. In fact, he stated that teachers can actually do more innovative and new things within their current environments than they are often willing to try or think they can. In thinking ahead to next school year, I want to make an effort to do less complaining about the box and start building, creating and innovating within whatever box my students and I find ourselves in. I have found this to be the case with many teachers I work with. We do a lot of talking about what we would like to do, and all too often it ends right there. I believe most teachers do the very best they can; the very best they know how. But in trying to do that they get bogged down in what they "have" to do. The mandates, the initiatives and so on. The thing is, once we step out and try some things, experiment, make something out of the boxes as you have said, we find some really great learning opportunities (for teachers as well as students). Thanks for sharing Josh. This metaphorical box you describe can apply to any educator including principals and upper administration. I too want to make an effort to create an environment in which fear of failure, repercussions, and fear of the unknown begin to disappear. To create an environment in which failure is not only an option, it's preferred. To create a place where the principal, teachers, and students all push the limits to raise the bar together. Thanks for sharing your reflection, Josh. It reminded me of a couple of conversations I had with teachers last school year. Some instructional decisions were being made because teachers thought that was what was expected of them. But after reflecting, we realized there was a better way to support kids (and no one could name who set up these expectations...it was probably just hearsay to begin with). The bottom line is that we all have to remember that we are licensed professionals and we can and need to make professional decisions on our own. As long as our decisions are grounded in the mission of doing what is the very best for kids, we can't go wrong. Thanks again for sharing! Josh, this is a thoughtful post- likely true for many people, in many fields. In terms of rethinking the educational box, there seems to be a tension between creating a more engaging, student-centered, enquiry-based learning environment, while also preparing students for college, with the requisite standard test score requirements. Teachers still seem to feel too pressured by material they "need" to cover, to explore what are likely much more valuable learning opportunities- like service learning projects etc... There seems to be a fixed notion of curricular requirements, much of which has limited or questionable learning value, or relevance to students- and yet, teachers seem to feel obliged to "get through" it- and the opportunity cost of more exciting, engaging learning, not pursued or explored, often seems to get lost along the way. How is 21st c skill development (creativity, critical thinking, connectedness, collaboration) reconciled with college prep in k-8 curriculum? I work in an open pod classroom - which would mean lots of noise back and forth. Three years ago, the other teacher in the pod and I wondered how it would work if I taught a mini-lesson to the entire 2 classes, then the classes split up for work/formative assessments. It worked so well, we started doing the same for all subjects. It cut our prep time in half - but the MOST valuable thing was that we began jointly/spontaneously evaluating our practice, the work we saw students doing, and more. So one day our administrator walks in. We worried that she would want us to go back to the more self-contained model. She now wants our pod to be a model for other groups. You (and Sir Ken) are correct: Take the risks. Amin like innovation - especially when they see happy, engaged students. Josh, I think I can speak a little bit to what holds teachers back based on my personal experiences this year. My two teammates and I, along with about 60 of our colleagues had the opportunity to work in a brand new building this year. While things ran more smoothly than I think we all expected (of course there were glitches, but things certainly could have been much worse), my teammates and I recognized that the initial team setup really wasn't appropriate for some of our 4th grade learners. We started trying different methods of teaching that hadn't been done before in my district, and after much research and many chats, we presented a proposal to adjust the teaming structure for this coming school year. Administrators were upset with us because it was "our idea" and not "their idea". Some teachers were angry with us because we were suggesting another change just 1 year after a monumental change. Still other teachers took our suggestion as a personal attack on their teaching abilities. The bullying that happened from administrators and teachers in an attempt to get us to back down from doing what was right for the kids was astounding. Conversations stopped when we walked into rooms, we were talked about behind our backs, and we were insulted right to our faces. While there were many times throughout the process where we looked at each other and wondered if it had really been worth it, the three of us stuck together because we knew our proposal was going to create a better transition and learning environment for our kids. My guess is that, sadly, this may be the culture that is present in many buildings, and innovators are more likely to be shunned or pummeled rather than welcomed with open arms. Thankfully we had the support of one very important administrator, and because of that our proposal will be happening this year. We do know that there are many who can't wait to tell us, "I told you so!" when things don't work out or go well, but that is making us extremely motivated to work hard this summer to be prepared for the new year. 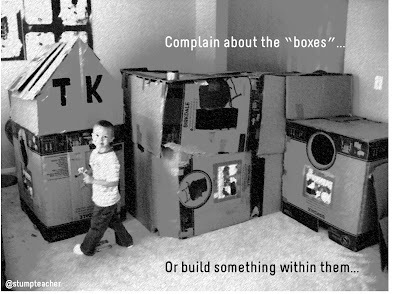 It's far easier to complain about the box rather than try to break out of it. I just hope that many more teachers will develop the courage and do what's right for kids.